The word Istikhara استخارة comes from root words خ-ي-ر in Arabic language. The 10th feminine verbal noun (إِسْتَفْعَلَ) of that root is إِسْتَخْارَة (The tenth form usually reflects the meaning of “someone seeking something”). Hence in this case – (human beings) seeking KHAIR (goodness, prosperity, guidance, blessings etc.) from Allah. Khayr is an umbrella word that represents all that which is good. and when you have narrowed down your options, it’s time for Salat-ul-istikhara! (Although dua is an important part of narrowing down your options as well). NOTE: memorize the istikhara dua by downloading this audio file (free) and listening to it on repeat till you learn it by heart in shaa Allah. If you don’t know Arabic, it may be sufficient to think of the matter whilst making this dua – although you can state your matter in your own language too later on – just like any other dua! 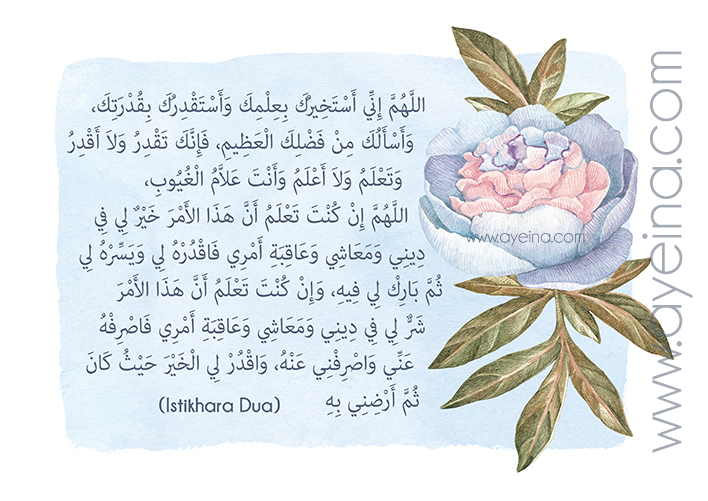 (in another narration (Bukhari), it is also stated that the person making this dua can mention his need in the middle – as shown in this hadith). If you feel content and things are naturally unfolding in that direction, say bismillah and go for it! May Allah put barakah in it for you! If you don’t feel confident and things are constantly going against the flow, it’s time to change directions. As simple as that! If you still feel confused, repeat the prayer whenever you want (except while the sun is rising, when the sun is at its peak (which lasts for a minute or so), and the setting of the sun – when we are told not to pray). You may continue to pray Istikhara until you have found resolution. 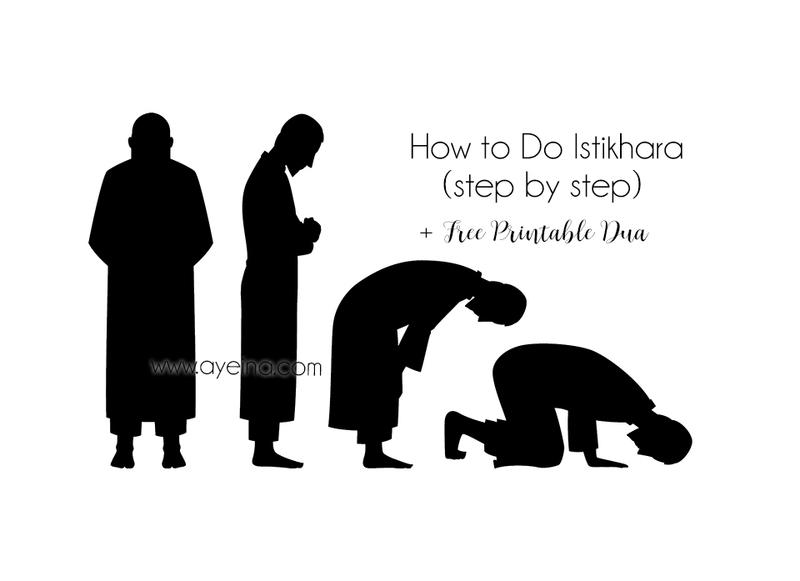 How to NOT Do Istikhara? You do NOT have to ask a scholar or any righteous person to do istikhara for you! The wordings of istikhara surrounds the word “I” – If someone else would be doing it, they’ll be asking for their khair in that matter (And if that person is not a part of that decision, it makes them irrelevant in the matter). If your family or anyone else involved in the matter (situations where one decision affects multiple people), they can do it too! But it’s YOU who needs to do it basically! You do NOT have to wait for a dream! Dreams do have interpretations indeed – but if you’re not qualified to interpret them (and VERY few people ACTUALLY are), no need to dig deep then! You can’t say if the dream is just a part of your subconscious or glad tiding from Allah or just something from Shaitaan! The dua says – “…make it easy for me to get…” – so if it’s causing more difficulties than ease, perhaps that’s a sign instead! Istikharah is not a means of discovering the ‘ghaib’ (unseen), but rather is a humble supplication unto the Knower of the unseen, the Most Powerful, to bestow the best. Our responsibility is to make du’a, and then proceed in the direction of His choice, as that will be best for us in shaa Allah. You can NOT do istikhara for the known matters – matters that are waajib (obligatory) or mustahabb (liked or encouraged), there is no need for istikhaarah to decide whether to do them, and with regard to matters that are haraam (forbidden) or makrooh (disliked), there is no need for istikhaarah to decide whether to avoid them. The issue of istikhaarah is confined to matters that are mubaah (allowed), or in mustahabb matters when there is a decision to be made as to which one should be given priority. It refers to both great and small matters – you don’t only have to do istikhara for marriage purposes! Istikhara can be performed for life’s small decisions, big decisions and even for general guidance in your life – probably an insignificant issue could form the groundwork for a big issue. (I mean I personally learned the istikhara dua and sometimes even end up making this dua while standing in the shop indecisive as to buy so and so or no 😀 (the dua can be made without the nawafil too if the situation doesn’t allow praying at that moment but making the dua after nawafil is the most preferred option and the actual sunnah – otherwise it’s simply a dua)). There is no extra special sūrah that should be recited in the first or second rak’ah. You do not have to be quiet after istikhara and sleep right away. Although remembrance of Allah can help you declutter your mind for better clarity! You do not have to add more words in an already-complete dua. Loved the article and the author detail both. May Allaah accept your good deeds and reward you for that, ameen.